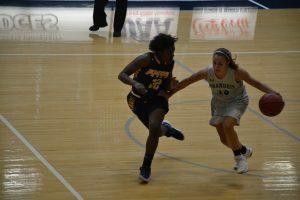 The Judges women’s basketball team took two difficult losses in the University Athletic Association (UAA) this past weekend. The Judges first took on the Rochester Yellowjackets at home on Friday, Jan. 9. Despite falling behind in the first quarter, 26-13, the Judges came out strong for the next two quarters. They outshot the Yellowjackets 19-7 and 20-11 in the next two quarters, taking the lead going into the fourth quarter against the 7th nationally ranked team. Noel Hodges ’18 led the Judges, scoring eight points in the second, giving Brandeis the first lead in the game with a trifecta. Katie Goncalo ’20 scored five strait points with 7:25 left in the period. Rookie guard Camila Casanueva ’21 earned Brandeis’ largest lead of the game, getting eight points ahead on a break-away lay-up. Sarah Jaromin ’19 made both of her foul shots, leaving the Judges with the lead of 50-48 going into the fourth-quarter. The final quarter started with Rochester going on an eight-point run and the Yellowjackets never fell behind again. Brandeis outrebounded Rochester 45 to 38 and was slightly ahead of Rochester in field goal percentage earning 35.6 percent to 34.4 percent. Brandeis fell in assists 17 to seven. Hodges led the Judges in points with 15 and rookie Jillian Petrie led the Judges in rebounds with eight. The Judges came back to Red Auerbach Arena to face the Eagles of Emory University on Sunday, Jan. 21. The Judges struggled offensively, which gave the Eagles the lead in three of the four quarters. The Judges kept the Eagles tight by only allowing a two-point lead at the end of the first quarter. The Eagles pulled away from the Judges in the second quarter outscoring the Judges 18 to seven. Just like Friday night, the Judges turned it around in the in the beginning of the second half outscoring Emory, 14 to nine. Goncalo helped earn a six-point lead with her three-pointer with 2:52 left in the third quarter. Hannah Nicholson ’20 got her free-throw which inched the Judges closer to the Eagles, but the Eagles gained momentum with a three-pointer at the buzzer making the score 40-32 in the Eagles’ favor. Classmate Lauren Rubinstein ’21 opened the fourth quarter with a three-pointer that got Brandeis back to a three-point deficit, but the Judges held a season low in scoring with 39 points. Eva Hart ’18 led the Judges with 10 points, with two three-pointers in the first quarter. She also had eight rebounds. Nicholson finished the game with eight points, a team high of nine rebounds and three assists. The Judges had 39 rebounds in the game with 11 total assists. Brandeis will continue hosting UAA games on Friday night at 6 p.m. facing off against Case Western Reserve University (CWRU). CWRU has a 3-12 record coming into this match against the Judges and are currently 0-5 in conference. They recently suffered a major loss against the University of Chicago Maroons 46-91. On Sunday, the Judges will face Carnegie Mellon for their Alumni Family Day at home at 2 p.m.